In the interdisciplinary learning process of visual art, the teachers must provide for the students effective gaining of integrated knowledge such that will encourage them to solve the art tasks creatively. This chapter presents partial results obtained on the basis of an experimental study by means of which the authors wished to determine the effects of visual art learning process conducted in an interdisciplinary manner. The findings of the qualitative analysis of sculpting works showed more creative art solutions by the students from experimental group, which additionally enforced the results of quantitative part of the experimental research carried out. This means that the guidelines concerning the manner of teaching visual art concepts will eliminate ambiguities in the planning of interdisciplinary teaching process applied in visual art education, and will provide the students with more efficient acquisition of integrated knowledge and creative solving of art tasks. Rapid technological development and scientific discoveries all contributed to the increase of school curriculum. 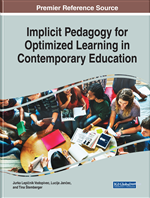 It is therefore one of the objectives of modern education to eliminate fragmentation of the school curriculum, to set up multidisciplinary integration and to modernize the manner of teaching thus optimizing the learning process and responding best to students’ needs in a technologically developed world (Jančec & Vodopivec, 2017, p. 58). Teaching and learning strategies that developed and are trying to replace the traditional way are aimed at promoting the active role of students, taking into account their interests and needs, as well as individual differences in experiencing, perceiving and learning different skills. In particular, strategies are chosen for linking similar or even overlapping contents of different objects (Rutar Ilc, 2011; Strmčnik, 2001; Zhang & Sternberg, 2005). In the present article the focus is on the interdisciplinary approach, which is for the purpose of this research defined as the curricular structure on the basis of which teachers combine information, techniques, concepts and theories from different disciplines and other fields of study in order for the students to make progress in understanding the learning contents, to be able to understand questions and suggest new solutions that go beyond the scope of traditional learning content in existing school curriculum. The article mentions various models of cross-curricular integration, which can also be used in the teaching of visual art. Visual art education applies various teaching strategies that encourage creativity in students and promotes a holistic visual art development. Interdisciplinarity, which signifies cooperation between different disciplines and fine arts, is one of the many ways to increase the learning performance and creativity since it is based on a more comprehensive acquaintance and more up-to-date organization of a learning lesson, all of which was demonstrated in the results of researches conducted (Birsa, 2011; Drake & Burns, 2004; Paulič, 2004; Sardoč, 2004; Strmčnik, 2001). The paper discusses the importance of promoting students’ creativity and the creative solution of artistic tasks in an interdisciplinary learning process. Teaching process of visual art should be based on students’ visual art knowledge, their visual art experiences and on their ability to correlate concepts from various school subject areas. Encouraging creative thinking, transferring knowledge through visual art and other concepts and already obtained visual art skills within individual visual art expression all contribute to a more successful and creative solving of art tasks. When planning and implementing interdisciplinary integrations the teachers are faced with certain uncertainties regarding the understanding of particularities of the strategy selected, in particularly concerning the manner of integration that would encourage successful and creative visual art work for the solution of art tasks (Tacol, 2007). Art works are being designed without setting in advance specific art goals and giving clear connections of content. In cases when a lesson is designed in such a way, the artistic expression is subordinate to the objectives of a different school subject of study. In practice, such interdisciplinary integration is deemed to be appropriate. Shortcomings may be found when addressing art problems, i.e. in cases when a teacher fails to encourage the students towards independent searching of conceptual correlations, creative thinking and towards designing original art solutions, all of which results in the schematic and mechanically rigid artistic works (Drake, 2007; Duh & Vrlič, 2003; Planinšec & Gril, 2009; Tacol, 2007). In this paper the authors presented in detail interdisciplinary integrations and pointed out the possible manners of integrations in visual art education for 5th grade elementary school students.